BEACON FALLS — Despite picking up its first two defeats of the year, the Woodland boys soccer team feels nothing but confident entering the homestretch of the regular season. 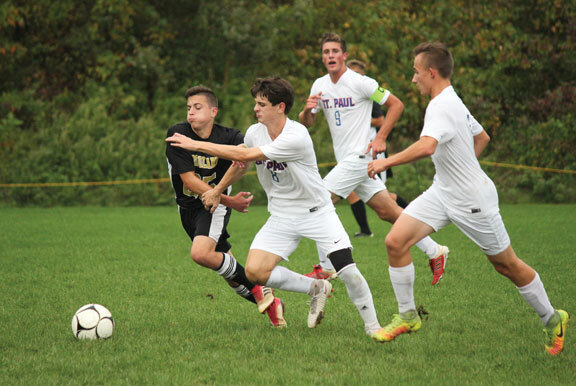 The Hawks suffered a 3-1 nonconference loss to Amity on Sept. 29 and a 2-1 loss to league-leading Watertown on Oct. 5. Woodland coach Tony Moutinho expected a stiff test in that nonleague game against the Spartans, but he was especially impressed with his team’s outing at Watertown. Jason Claiborn continued his strong offensive play by netting the Hawks’ goal against the Indians. Ryan Lamb made nine saves to keep Woodland in the game. The Black and Gold rebounded with a dominant 8-0 victory over Oxford on Oct. 9 and a 2-1 win over Torrington on Oct. 12 to improve to 7-2-3. Dante Polletta and John Walsh netted two goals apiece, while Josh Powanda, Omar Turshani and Christian Hotchkiss each added a goal versus Oxford. Claiborn and Cole Barrows scored against Torrington. Woodland’s attack stands to earn a boost with the impending return of Maciej Lewicki, who was poised to lead the Hawks’ offense before a back injury caused him to miss the preseason and most of the regular season. He recently returned to light practice, and Moutinho expects him to be available when the Naugatuck Valley League tournament begins Oct. 27. Woodland is set to host Kennedy on Monday. The Hawks will visit Holy Cross on Friday, followed by a visit to Seymour Oct. 22 and a season-ending match against Derby on Oct. 24. Editor’s note: This story has been updated from the version that is published in the Oct. 18 edition of the Citizen’s News to include information on games played after press time.